Famous actress Larysa Kadyrova played the role of Maria Zankovetska. In October, within the framework of the 9th Women’s Theater Festival of Solo Performances, the pilot version of the play was presented. Now, after some improvements Maria appeared on the poster of the Ivan Franko Theater. For Kadyrova the role of Zankovetska is very important and is one of the deepest she ever played as an actress in almost 50 years on stage. Larysa Kadyrova put on a mask of a majestic woman who has a tragic nature. The plot is based on correspondence between Zankovetska and Sadovsky and the historical documents. All of that takes the audience to the time, when genius people lived. At the beginning of the play Zankovetska appears before the audience in the role of an eccentric Pronia (Chasing Two Hares). The actress considered this role a failure. Comic side of Pronia Prokopivna contrasts with tragic character of mise-en-scenes that follow. The heroine has a sudden heart ache, she does not know if she would live until night. On stage the actress turns first into Starytsky’s Aza (Aza the Gyspsy), then into Schiller’s Lady Milford (from the play Intrigue and Love). Each of these masks of the theater world reveals the inner world of a woman doomed to tragic life. The actress admits that she deliberately chose to work in a Ukrainian theater, even though she had an offer from the Saint Petersburg Theater. But she chose the culture that had no support, was banned and oppressed. The theater of coryphaeus became her theater, the world where she felt free! Her first marriage was unhappy and her second love was tragic. Love to Mykola Sadovsky could be called a powerful element. That’s why Zankovetska so tragically perceived his betrayal. Zankovetska loved Sadovsky until her very last day. 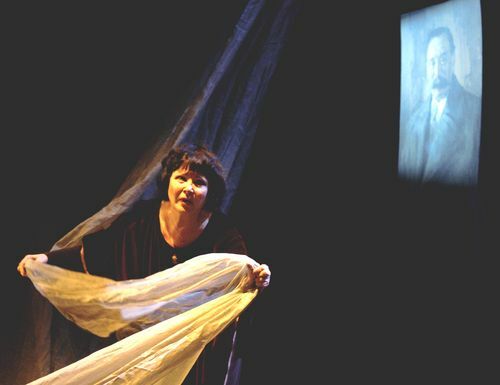 Zankovetska in the play lives and acts her entire life. Not by chance there is a triple mirror on her table. On the edge of the stage there are scattered flowers – flashes of glory. However, there is an even number of flowers. And the mirror – symbol of death, brings out a counterpart and the main character is actually talking to it. Later this counterpart has to take the “original” to the other side. Outside a coffin with Sadovsky is carried. Zankovetska was faithful to him all her life. “I am a one-man woman.” Such is the essence of women’s nature, who when in love with someone gives up herself completely for it. The play Maria is about love and death, about the eternal themes of human existence, about woman’s race with time, the willingness to sacrifice, and the tragic choice. The production strikes with its philosophical depth. This performance was staged in the manner of the Maeterlinck or Ibsen’s theater. It has nothing excessive, nothing that would distort the image of the actress, and nothing that could have made it simplistic and artificial. Kadyrova managed to convey the depth of the two most complicated states – love and betrayal. The action takes place in the conventional “black space” (Peter Brook) in which there is the emptiness of death, solitude and silence… Zankovetska speaks beyond time and space, she speaks to her future, speaks for her Ukraine, which has to remember her at some point.